Leslie Andrews is the Director of Golf at Nehoiden Golf Club at Wellesley College, overseeing all golf instruction and programming. 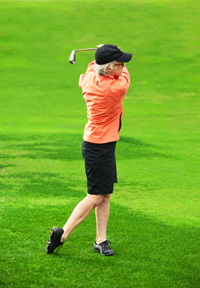 Leslie is a Class A member of the LPGA, and is the former Executive Director of the LPGA Teaching & Club Professionals. Prior to joining Nehoiden, Leslie served as Director of Instruction at Randall’s Island Golf Center in New York City, the busiest golf facility in the US. In addition to managing a full private clientele, she also oversaw all instruction, instructor training and development, golf programming and corporate golf development programs. Having learned to play golf at age 30, Leslie has enormous empathy (that’s different from sympathy!!) for people learning to play golf as an adult. She is also real-life evidence that you can pick up the game relatively late in life, and get pretty good at it. Golf is a second career for Leslie. Having spent years in corporate America, mostly at ESPN, Leslie has a particular interest in Women, Golf & Business and has dedicated much of the last 15 years to helping women learn to play golf and to use golf as a business tool. Leslie published the definitive guide to women, golf and business: Even Par: How Golf Helps Women Gain the Upper Hand in Business. Leslie is a sought-after speaker on this topic, having spoken at the Harvard Business School Women in Business Forum, the Barclay’s Women’s Conference, the EWGA National Conference, among others. In addition, Leslie has worked with many corporations in helping them design and execute programs designed to help women learn to use golf for business, including Goldman Sachs, Jefferies, EY, Financial Women’s Association, Women’s Bond Club and others. Leslie is a former Fortune 500 marketing executive, having spent most of her corporate career at ESPN and Disney. She is a graduate of Wellesley College and the Tuck School of Business.